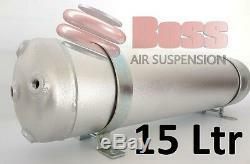 This is a brand new 15 Ltr Air Tank by BOSS along with all the bits a tank needs. 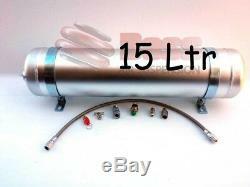 Part # AT05 - 5 Gal / 15 Ltr. If you need to ask someone about whether this item is right for you or if you have any questions at all then please just call me on. 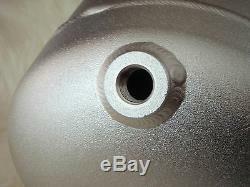 1 Piece Non Rust Aluminium. No join extruded centre for improved safety. Providing Clean air for valving & fittings. Shot Blasted, Anodised & T6 Heat Treated. Ability to mount in endless configurations, spin the barrel so the drain valve is always facing the bottom, adjust the width to fit different mounting points! 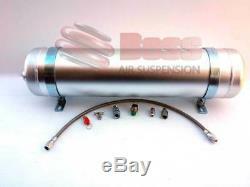 Boss Manufactures lightweight T6 heat treated aluminium air tanks, with a range of tank sizes, port configurations and port sizes. Furthermore our tanks are rust free, providing clean air for valves. Also all 9L (3 gallon) & 15L (5 gallon) tanks can be mounted in 3 angles. On end, upright or upside down and still keep drain port at bottom with our unique design. Shot based anodized or chrome finish. Also recommended working pressure is 0 - 170psi. While maximum pressure is 400psi. Sizes range from 2 litres through to 15 litres with extruded centre section and stamped ends. Easily run nail guns and rattle guns from this tank and even blow the dust off with one of those trigger nozzle thingies. Still good for diff locks too. Air tanks are like Pizza's - the bigger the better. The more air you have the faster your tyres inflate. This is the biggest in the BOSS range. Or you can remove the mounting legs totally and fashion up your own U-bolts and now you don't loose any height at all for the mounts. All of our gear may be picked up from our official BOSS development center in Labrador on the Gold Coast or we can send anywhere in Aus (or with express options) or Worldwide at affordable rates. If you have an ABN we can help you with trade prices. Almost every air bag application we do is bolt in. No welding or cutting or drilling. We make that a mandatory requirement when we develop a new kit. And we will make sure we do better. We wont be beaten on price, quality or service. Happy customers is our key to success. People often ask why or how are we so much cheaper than Firestone. So our costs are way down and if we charged Firestone prices we would be ripping you off. Over the years we make improvements where we can and so by now we have become a market leader recognised for having the best product at the best prices. BOSS also have a development center in Canada looking after our Canadian and American interests. We have a lot of exciting vehicle applications in the USA that eventually filter through to Australia and other parts of the world and so we have a very extensive range which includes all the American pick ups as well as the old classic cars like Chev and Buick. At BOSS we dont copy others - To begin with we dont trust the others to get it right. But more importantly the others dont have anything to copy. BOSS are the first to get hold of new vehicle models and get kits to market having tried and tested them, fully getting to understand the vehicle and the engineering required. As such BOSS have the widest range of applications for Australian and USA markets and we are onto all the new models even before they are released. BOSS have the most comprehensively wide range of accessories as well. All of our air compressors can be rebuilt and we stock those parts. We have tanks, pressure switches, water filters, braided lines, digital pressure gauges, everything for in car operation of your bags, the list goes on and on. BOSS air bags are manufactured in our BOSS factory with our own machines to our own exacting standards and specifications. We strongly believe it's the only way of maintaining strict control over the bags. Here are some interesting facts... It takes over 20 minutes for each bag to go from the raw un-cured blended rubber to a cured air bag. 1 machine can only make 1 bag at a time. Its not just the thickness of the rubber that gives the bag its strength but also the angle of the reinforcing cords and design of the woven beads. The proprietary ballistic material used for the woven reinforcing on the airbag wall, along with the specific spacing and angle of the weave, is what gives our air bag its unique strength. The bead ring ends of the bag are constructed of 4 Hi-tensile cords at each end, ensuring that the top and bottom hold their shape and cant be pulled away from the Aluminium clamping ring. The center of the air bag (the part of the bag with the most stress) is constructed using 9 strands of Hi-Tensile steel to form an indestructible center support. Our competitors's bags have less than half these strands. The BOSS airbag machines are operated at over 400psi while the curing process is taking place with very high heat. There's an internal bladder pushing the airbag case into the mould ensuring consistency throughout the airbag wall. Each air bag machine has over 50 tons of clamping pressure on the mold during curing. Effectively these are desperately over engineered as there's no way you could ever exert over 50t and 400 psi on a bag in your vehicle. The factory tests selected bags to destruction within a controlled chamber to ensure continued bag quality and identify possible ways to constantly improve the design and technique. We have just recently released the exciting new EX-2 Bags. They have a 5 year leak free guarantee. Tooling was modified to provide for a heavier and wider rim width. BEWARE: Some other brands use crimped-on end caps. Crimped or Banded air bags are prone to popping the end caps out at anything over 100psi and often simply pull the end caps out when the bag is fully extended. BOSS air bags are undeniably the strongest in the automotive industry and exceed any other air bag brands by nearly double. We pride ourselves in looking after everyone. Even if you have had your gear for years we will still look after you because who knows, our next customer could be your friend you refer to us. Ver 100 different air bag leaf and coil load assist kits. BOSS does coil replacements kits. 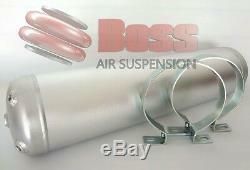 BOSS does full air suspension systems. BOSS does package deals with different in cab and compressor options. 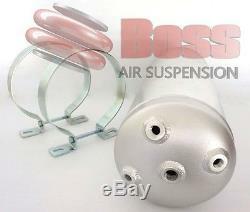 And of course, BOSS does air suspension for Harley Davidson bikes... So you see BOSS is 100% focussed and committed to delivering all the best gear. There is a selection of our other popular accessories and add ons. Like we said, no one else offers such a huge list of optional bits. The item "BOSS Air Tank Aluminium Alloy 15 litre 5 gallon AT05 COMPLETE" is in sale since Tuesday, October 3, 2017. 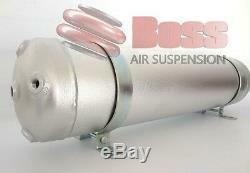 This item is in the category "Vehicle Parts & Accessories\Automotive Tools & Supplies\Air Compressors". The seller is "bossproducts" and is located in Moreton, QLD. This item can be shipped worldwide.